For other uses, see Channa (disambiguation). 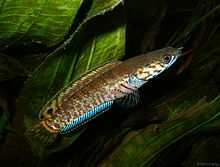 Channa is a genus of predatory fish in the family Channidae, commonly known as snakehead, native to freshwater habitats in Asia. This genus contains more than 45 scientifically described species. The genus has a wide natural distribution extending from Iraq in the west, to Indonesia and China in the east, and parts of Siberia in the Far East. A particularly high richness exists in Myanmar (Burma) and northeastern India, and many Channa species live nowhere else. In contrast, a few widespread species have been introduced to several regions outside their natural range where they often become invasive. The large and medium-sized Channa species are among the most common staple food fish in several Asian countries and they are extensively cultured. Apart from their importance as a food fish, snakeheads are consumed in some regions as a traditional medicine for wound healing and reducing post-operative pain and discomfort, and collected for the international aquarium pet trade. All snakeheads are highly predatory and the diets of the various species of Channa include fish, amphibians (like frogs), snakes, rodents, birds and invertebrates (like insects and crustaceans). They have a labyrinth organ, which allows them to breathe air for short periods, and they use this adaptation to travel across land in the event that their habitat becomes inhospitable. They are mostly solitary or live in monogamous pairs that are highly aggressive towards outsiders of their own species, but C. pleurophthalma often occurs in small groups. Larger species are mostly nestbrooding (making a nest of vegetation at the water surface), and the dwarfs mostly paternal mouthbrooding, but there are exceptions: the large C. barca is a paternal mouthbrooder and the dwarf C. bleheri is a free-spawner (the eggs float to the surface where the parents take care of them, but they do not mouthbrood or built a nest). In Assamese it is called goroi. In Malayalam it is called varal or braal. In Bhojpuri it's called "Garai"
The taxonomy of the genus Channa is incomplete and a comprehensive revision of the family has not been performed. A phylogenetic study in 2010 has indicated the likelihood of the existence of undescribed species of channids in Southeast Asia, and a more comprehensive phylogenetic study in 2017 indicated that there are several undescribed species in Asia (as well as an undescribed Parachanna in Africa). In 2011, the Malabar snakehead Channa diplogramma from peninsular India was shown to be a distinct species, 146 years after its initial description and 134 years after it was synonymised with C. micropeltes, establishing it is an endemic species of peninsular India. The study also suggested that the species shared a most recent common ancestor with C. micropeltes, around 9.52 to 21.76 MYA. ^ a b c d Kumar, K., R. Kumar, S. Saurabh, M. Sahoo, A.K. Mohanty, P.L. Lalrinsanga, U.L. Mohanty and P. Jayasankar (2012). Snakehead Fishes: Fact Sheets. Central Institute of Freshwater Aquaculture, Bhubaneswar. ^ PracticalFishkeeping (13 June 2016). Quick Guide to Snakeheads. Retrieved 12 February 2019. ^ SeriouslyFish: Channa bleheri. Retrieved 12 February 2019. ^ Adamson, E.A.S., Hurwood, D.A. & Mather, P.B. (2010): A reappraisal of the evolution of Asian snakehead fishes (Pisces, Channidae) using molecular data from multiple genes and fossil calibration. Molecular Phylogenetics and Evolution, 56 (2): 707–717. ^ a b c Conte-Grand, C., Britz, R., Dahanukar, N., Raghavan, R., Pethi-yagoda, R., Tan, H.H., Hadiaty, R.K., Yaakob, N.S. & Rüber, L. (2017). Barcoding snakeheads (Teleostei, Channidae) re-visited: Discovering greater species diversity and resolving perpetuated taxonomic confusions. PLoS ONE, 12 (9): e0184017. ^ Benziger, A., Philip, S., Raghavan, R., Ali, P.H.A., Sukumaran, M., Tharian, J.C., Dahanukar, N., Baby, F., Peter, R., Rema Devi, K., Radhakrishnan, K.V., Haniffa, M.A., Britz, R. & Antunes, A. (2011): Unraveling a 146 Years Old Taxonomic Puzzle: Validation of Malabar Snakehead, Species-Status and Its Relevance for Channid Systematics and Evolution. PLoS ONE, 6 (6): e21272. ^ Li, X., Musikasinthorn, P. & Kumazawa, Y. (2006): Molecular phylogenetic analyses of snakeheads (Perciformes: Channidae) using mitochondrial DNA sequences. Ichthyological Research, 53 (2): 148-159. ^ Froese, Rainer, and Daniel Pauly, eds. (2019). Species of Channa in FishBase. February 2019 version. ^ Eschmeyer, W. N.; R. Fricke & R. van der Laan (eds.). "Channa species". Catalog of Fishes. California Academy of Sciences. Retrieved 11 February 2019. ^ Britz, R. (2013): Channa andrao, a new species of dwarf snakehead from West Bengal, India (Teleostei: Channidae). Zootaxa, 3731 (2): 287–294. ^ Lalhlimpuia, D.v., Lalronunga, S. & Lalramliana (2016): Channa aurantipectoralis, a new species of snakehead from Mizoram, north-eastern India (Teleostei: Channidae). Zootaxa, 4147 (3): 343-350. ^ Praveenraj, J., A. Uma, N. Moulitharan and H. Bleher (2018). Channa bipuli, a new species of snakehead (Teleostei: Channidae) from Assam, northeast India. aqua, International Journal of Ichthyology 24(4): 153-166. ^ "A New Species of Dwarf Channa (Teleostei: Channidae) from Meghalaya, Northeast India". Novataxa. Retrieved 11 February 2019. ^ Geetakumari, K. & Vishwanath, W. (2011): Channa melanostigma, a new species of freshwater snakehead from north-east India (Teleostei: Channidae). Journal of the Bombay Natural History Society, 107 (3): 231-235. ^ Nguyen, V.H. (2011): Two new species belong to genus Channa (Channidae, Perciformes) discovered in Ninh Binh province, Vietnam. Vietnam Journal of Biology, 33 (4): 8-17. ^ Knight, J.D.M. (2016): Channa pardalis, a new species of snakehead (Teleostei: Channidae) from Meghalaya, northeastern India. Journal of Threatened Taxa, 8 (3): 8583-8589. ^ Praveenraj, J., A. Uma, J. D. M. Knight, N. Moulitharan, S. Balasubramanian, K. Bineesh and H. Bleher (2018). Channa quinquefasciata, a new species of snakehead (Teleostei: Channidae) from Torsa River, North Bengal, India. aqua, International Journal of Ichthyology 24 (4): 141-152. ^ Thakur, V. R.; Raymond, J. J. A.; Halalludin, Beni; Kiruba-Sankar, R.; Knight, J. D. M.; Praveenraj, J. (2018-12-31). "Channa royi (Teleostei: Channidae): a new species of snakehead from Andaman Islands, India". Indian Journal of Fisheries. 65 (4). ISSN 0970-6011. ^ Endruweit, M. (2017). Description of a new dwarf snakehead (Perciformes: Channidae) from western Yunnan. Vertebrate Zoology 67(2): 173-178. ^ Lalramliana, J. D. M. Knight, D. V. Lalhlimpuia and M. Singh (2018). Integrative taxonomy reveals a new species of snakehead fish, Channa stiktos (Teleostei: Channidae), from Mizoram, North Eastern India. Vertebrate Zoology 68 (2): 165-175. ^ "A New Ornamental Species of Snakehead Fish (Teleostei: Channidae) from River Torsa of West Bengal, India". Novataxa. Retrieved 11 February 2019. This page was last edited on 14 February 2019, at 22:19 (UTC).